What a way to cool yourself off on a hot day!!!!! 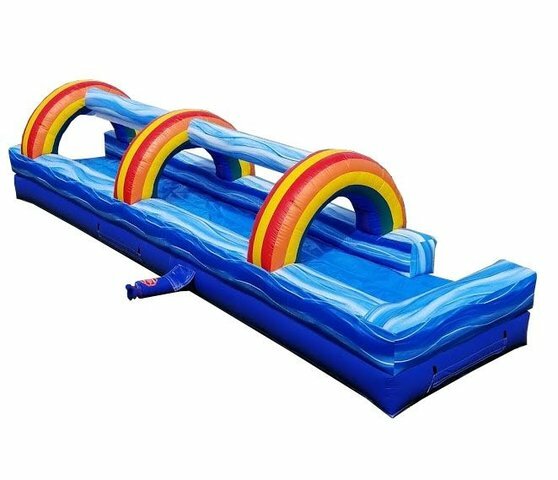 This 30 ft slip n slide will give your party hours of cooling fun..... With a running start it's easy to slide on your belly all the way to the end of the slide, under three brightly colored rainbow arches!!!!!!!! The Splish Splash Super Soaking 30' Blue Marble Slip-N-Slide is a perfect inflatable slide for any event. The misting hoses ensure that the slides stay wet and slick for easy play that is guaranteed to provide hours of fun at a party. This entertaining slip-n-slide can be set up with ease at any event. It is sure to keep kids and adults delighted with lots of wet and dry sliding action. Splish Splash Super Soaking 30' Blue Marble Slip-N-Slide is a completely safe slide for children as it is designed in a manner where they must slide properly. It is also highly durable as each of the stress points have been reinforced to prevent tearing at the wall and floor joints. Therefore, the slide can be used again and again for a variety of events.